An ideal solution for storyboards and animatics ! Thanks to TVPaint Animation Professional Edition, you can easily organize your projects. Each project is composed of scenes, and each scene is composed of shots (named "Clips" in the software). 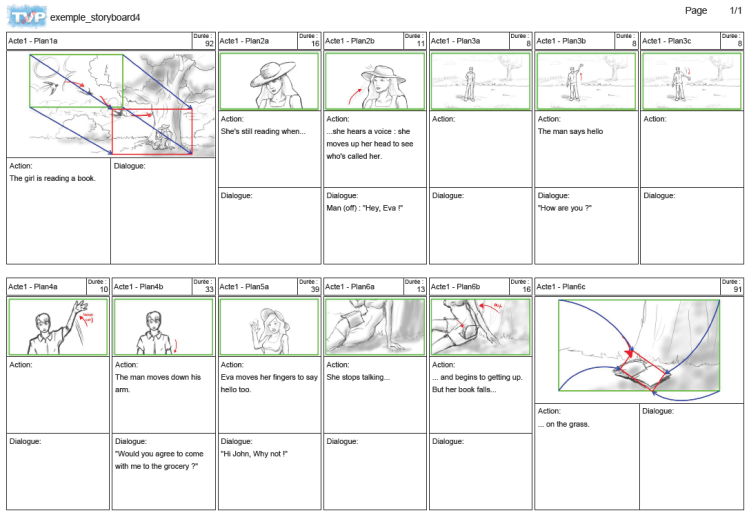 In other words, you can make storyboards quickly and view them instantaneously as animatics. The time where you had to scan each drawing, then put them together in a compositing program is over! You can manage storyboarding features of TVPaint Animation in the "Project" tab of the timeline window. You can create "scenes" and "clips". Each clip corresponds to the space where you can add layers and animate. ● the "Thumbnail" view mode (shows only clips, giving you an overall view of your project). ● the "Timeline" view (shows a single continuous timeline of all the clips in a project). Use groups to organize your clips ! As you can put your layers in groups, differentiable from colors, it is now possible to keep your clips and soundtracks in groups. You can even disable one or several clips : those one will not be read when the animation is played, but they could be re-used later, if necessary. With the Camera Tool, you can easily add pan and zoom transitions to your shots. Camera size can be be changed without modifying the size of the drawing space. The timing and acceleration of camera movements can be controlled with a time profile curve in order to create jump-cuts, slow-in/slow-out speed transitions and more. In addition, all camera movements are instantly visible in Clip thumbnails and on your printed storyboards! You can export your storyboards in PDF and HTML format for sharing with animators, layout personnel, directors, producers etc. Thanks to the PDF format and its options, you can quickly choose your sotryboard's contain and aspect before printing it. You can also edit the .html file, to modify or add text, images, and logos, without having to re-export your storyboards. Last but not least, you can preview animations(complete with camera movemets) in exported HTML storyboards from your web browser by moving your mouse over the clips! See for yourself ! All storyboards made in TVPaint Animation Professional Edition can be viewed instantly as animatics, and can be exported in .avi or .mov. formats. TVPaint Animation Professional Edition also allows you to export your clips as separate video files accompanied by an Edit Decision List (.EDL) file. When EDL files are opened in editing programs that support the EDL format, all of the clips that make up your storyboard can be automatically imported in the proper order. TVPaint Animation Standard Edition allows you to make storyboards, but the Professional Edition lets you view storyboards as animatics, add text (dialog, action, notes) to clips, add soundtracks, and it includes the Camera tool. That's why we suggest TVPaint Animation Professional Edition for storyboard artists, in order to have access to all the features mentioned above.